A group of UK university bosses have called Labour’s plans to cut annual tuition fees from £9,000 to £6,000 “implausible,” prompting critics of university management and the coalition’s education policies to speak out. The opposition party has yet to officially unveil the policy, but Labour party leader Ed Miliband has said previously he is in favor of lowering the cap, which was raised to £9,000 ($13,500) by the coalition government in 2010. In a letter to The Times, vice-chancellors from the board of Universities UK said reducing the fee cap would leave universities £10 billion ($15 billion) worse off over the next five years. The letter warned that the effects of a lowered cap would also have repercussions throughout the whole economy. 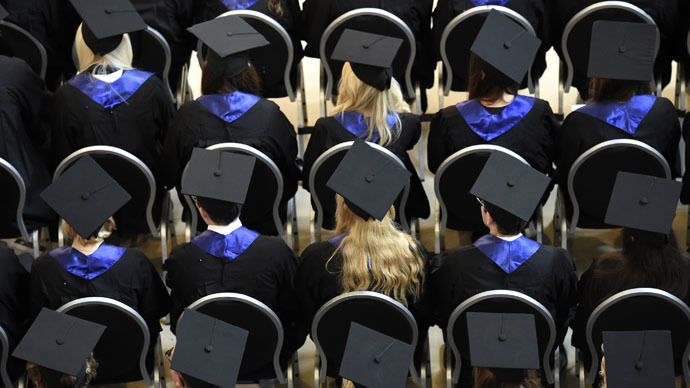 The letter, written by Sir Christopher Snowden, vice-chancellor of the University of Surrey, and signed by members of Universities UK, said that instead of making fees lower the government should provide better support to students from poorer backgrounds by increasing the levels of living allowances. “Any move to limit the number of students attending universities as a way of reducing costs would remove opportunities for young people and those seeking to return to education, and act as a barrier to economic growth,” the letter reads. Critics of the policy say that lowering the fee cap would leave universities at the mercy of government funding and more vulnerable to cuts. There has also been mixed reaction from steadfast campaigners for free education, who, in parts, echo Snowden’s sentiment that Labour’s plans do not tackle the root of the tuition fee problem. Speaking to RT, Deborah Hermanns, from the National Campaign Against Fees and Cuts, called the policy “cynical,” suggesting that Labour was turning the need for a different funding system into a populist policy. “However, it is not the funding system that we are asking for: we will not stop until we win free education, funded not by a graduate tax but by progressive taxation,” Hermanns added. Reaction to the mooted Labour proposal has been mixed, with both critics and supporters weighing in on social media. Some argue those paying a higher rate of fees should be given compensation if fees are reduced for new students. If #Labour are thinking of £6K c.f. £9K tuition fees, what happens to those who've been paying over last few years? I'd vote for reduction. Others say the aim of the policy is misguided and won’t directly benefit students. The 2010 increase to tuition fees was a blow to Deputy PM and Liberal Democrat leader Nick Clegg, who had promised to defend free education before the election but later switched to supporting the £9,000 tuition fee after he joined the Tory-led coalition government.